The Doklam impasse looked resolved last year when both Bharat & China agreed to maintain status quo and shift to their original positions. For Bharat, it was a moral victory as it had succeeded in thwarting China’s attempt to build a road in Bhutanese territory apart from helping its neighbour as per treaty obligations. Chinese President Xi Jin Ping was seeking a second term and was busy with his internal manipulations within the Communist Party of China. He not only succeeded in winning a second term but also amazingly tweaked the constitution to be elected President for life without a whimper of protest; only 2 out of 3000 delegates opposed his candidature thus heralding a unilateral and a one-man power centre in the party for the first time since Mao Zedong. China, which is in the habit of riding roughshod over its neighbours was surprised by Bharat’s resilience and had to back off amidst growing international opinion and Xi Jinping’s preoccupation with domestic politics as he was in the process of reasserting himself on the party & the government. Having emerged stronger than ever, he has again started his ambitious designs of expansion and intimidation . 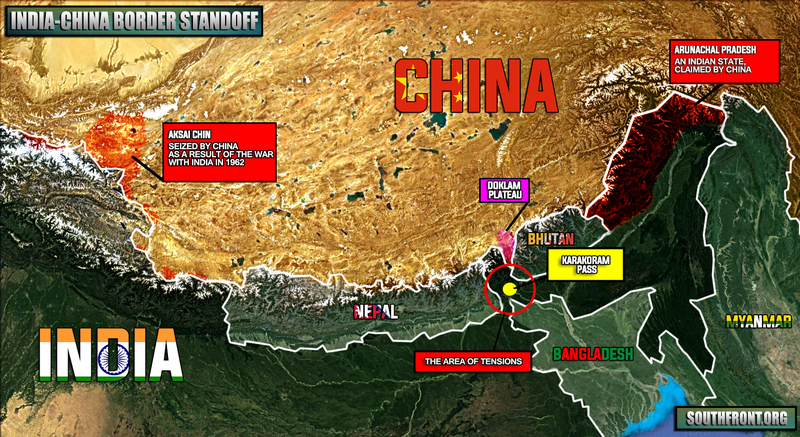 Now as reports emerge of a fresh military build up by China along the Doklam plateau, it is clear that China is miffed by the stand taken by Bharat to help its close friend & ally Bhutan and is again flexing its military muscle to intimidate Bharat. The current troop build up by China along with the laying of airstrips and other infrastructure is cause for concern and has to bematched by Bharat by improving road connectivity for faster troop deployment. Bharat has an advantageous position in Doklam as its troops sit on higher ground and have an eagle eye on the enemy’s movement. The chicken’s neck – a narrow cross way and thus its name – is Bharat’s only connect to the north east and needs to be protected at all costs. China hasn’t reconciled to Bharat’s increasing infrastructural build up including the building of airstrips in Arunachal & the Eastern sector, which had long remained on the back burner until the Modi government took over. The Prime Minister’s visits to Arunachal has further underlined the importance & significance that the North East holds in the eyes of the present dispensation at the centre. This has further irked & infuriated China which has been continuously eyeing Arunachal and nurtures ambitions to grab Bharat’s territory in the Eastern sector . The Chinese reinforcements & troop deployment in the Doklam region is in retaliation for the increasing infrastructural investment by the Modi government in the Eastern sector. Bharat needs to maintain its stand in Doklam without giving an inch, otherwise China will make a dent in Bharat’s territory as it has already done with its neighbours. However, does China really want a confrontation with Bharat or is it mere posturing? With the massive trade surplus that China enjoys with Bharat, it cannot afford a military misadventure along the border even as America is in the process of imposing trade barriers for Chinese goods. China cannot afford two of its most lucrative markets to get eroded simultaneously as it would send the Chinese economy in a tizzy. While Bharat’s trade deficit with China is close to over 50 billion dollars, the latter enjoys a massive 400 billion dollars trade surplus with the US. With such high stakes China cannot afford to open two frontiers and risk economic retaliation by Bharat even as America is all set for a trade war with China. It won’t be a bad idea for Bharat to use it’s economic leverage & squeeze China a bit so that it is aware of the ramifications of any aggression in the Eastern sector. China continues to oppose Bharat’s entry in the NSG apart from defending international terrorists Masood Azhar & Hafiz Saeed, and there is no need to placate or pacify the dragon. The only way to deal with the dragon is to look it in the eye without retracting an inch so that it does not underestimate its opponent & Bharat should do just that by matching the Chinese military build up at Doklam as a precaution, though the Chinese will not commit harakiri at this stage when they are already in a trade war with uncle Sam.